The SchoolCity Suite allows the user to create a variety of assessment types. This document provides an overview of the various types of assessments. 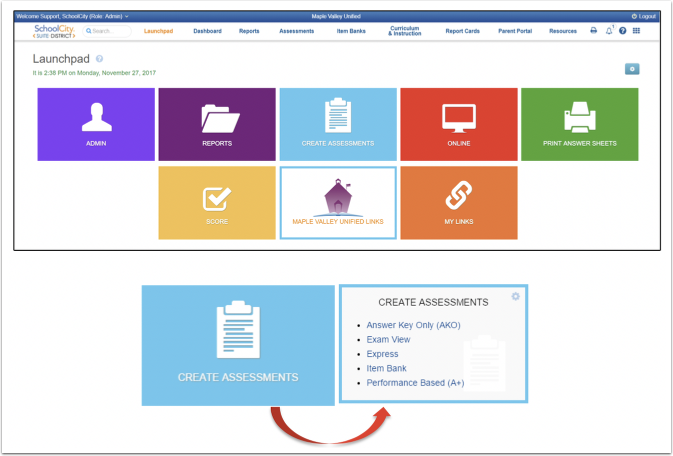 From the Launchpad, click on the CREATE ASSESSMENTS flip card to turn it over to reveal the assessment options. An Answer Key Only Assessment allows the user to create an answer sheet for an existing assessment. Users can align items to standards as well as use a variety of item types. Students can take the AKO Assessment online in the Student Portal using an online answer sheet, providing a PDF of the assessment has been uploaded into SchoolCity Suite. Students can also take the assessment on paper using a scannable answer sheet. The answer sheets can be scored by using SchoolCity Scan or GradeCam™ technology. Teachers may also enter student answers on an online answer sheet after administering the assessment on paper. An ExamView Assessment allows the user to create a publisher’s assessment in ExamView, and import it into the SchoolCity Suite using Blackboard 7.1 or higher. Students may take the assessment online in the Student Portal or on paper using a scannable answer sheet. The answer sheets can be scored by using SchoolCity Scan or GradeCam™ technology. An Express Assessment allows the user to create an answer sheet for an existing assessment that is not aligned to content standards. Students can take the Express Assessment online in the Student Portal using an online answer sheet, providing a PDF of the assessment has been uploaded into SchoolCity Suite. Teachers may also enter student answers on an online answer sheet, after administering the assessment on paper. Item Bank Assessments allow the user to select items from a repository of electronically available test questions and package those items together to form an assessment. Item banks have a wide selection of technology enhanced item types (TEIs) that can only be administered online in the Student Portal. With limited item types, students can also take the assessment on paper using a scannable answer sheet. The answer sheets can be scored by using SchoolCity Scan or GradeCam™ technology. A Performance Based A+ Assessment allows the user to create a scoring grid for a performance based test. It can include assessment objectives (or sub-scores) and be aligned to content standards. Students are assessed on the performance task using a variety of scoring methods. Scores are then manually entered into the scoring grid for data analysis. What type of assessment should I use and when? Use the Answer Key Only (AKO) when you already have assessments made in either hard or digital format and want to score the assessment through SchoolCity Suite in order to view the associated reports. The AKO accommodates seven item types: Constructed Response, Evidence Based Selected Response, Multiple Choice, Multiple Response, Multiple Binary, Numerical Response, and Short Answer. Use the ExamView (EV) option when you have assessments associated with your textbooks or publishers that you wish to administer through SchoolCity Suite in order to quickly score and view the reports associated with your assessment. You must use Blackboard 7.1 or higher in order to import an ExamView assessment. Use the Express (EX) option for those quick assessments for which you do not need to align standards; for example, those quick “ticket out the door” quizzes with 5 questions or less that let you know if your students grasped the day’s lesson. The Express assessment accommodates seven item types: Constructed Response, Evidence Based Selected Response, Multiple Choice, Multiple Response, Multiple Binary, Numerical Response, and Short Answer. Use the Item Bank (IB) option when you want to create a new assessment using items from a purchased Item Bank, or using items and passages you have created within SchoolCity. If your district has purchased one or more Item Banks, you have access to thousands of items, including Technology-Enhanced Items (TEIs) associated with your grade and four main content areas English Language Arts, Math, History/Social Studies, and Science. In addition, you can create your own items and store them in your personal item banks to use with your Item Bank assessments. Use the Performance Based (A+) assessment to gauge students’ performance on performance task assessments. You have the option to include standards and/or objectives (sub-scores) in the A+ Assessment. Including them allows for more reporting options after the test results have been entered in SchoolCity Suite. Objectives are not lesson objectives about what students should be able to do at the end of the lesson. Instead, assessment objectives are the aspects of the assessment that would be scored separately. For example, on a writing performance based assessment, the student may be scored on the introduction, evidence/support, word choice, organization, fluency, etc., based on a rubric. This is also an effective choice for primary grades where foundation skills are tested on a regular basis.